SOUTHINGTON - After an ugly start, the Southington football team finished its season opener in dominating fashion. After falling behind early, the Blue Knights scored the game’s final 41 points and walked off Fontana Field with a 41-7 win over Glastonbury. 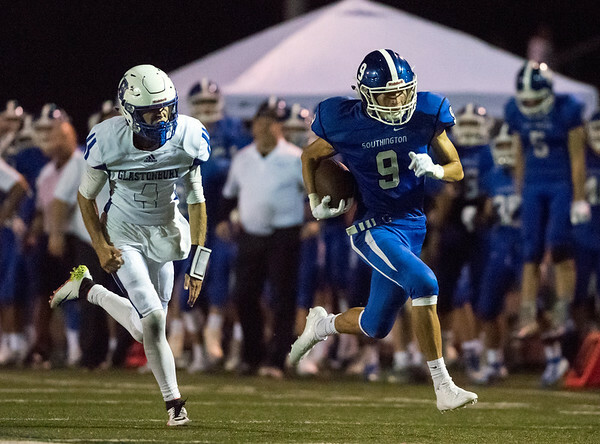 The story of the game was the passing attack, led by senior quarterback Jacob Drena, who was making his first career start after spending the last three seasons behind former Blue Knights Will Barmore and Jasen Rose. Drena started the game with an interception on his first pass, which led to the only Glastonbury score, a 6-yard rushing touchdown from Matthew Tenney. But Drena settled in after that and looked like a star quarterback, throwing for 356 yards on 16-of-24 passing and five touchdowns in the game - three to Jacob Flynn and two to Will Downes. Flynn had 170 yards receiving, all of which came in the first 24 minutes. The bounceback from the quarterback came as no surprise to Southington head coach Mike Drury. Another spotlight was on Southington’s new-look defense. Despite having just three returning starters, the Blue Knights looked like a seasoned squad on defense. The Tomahawks were held to just 155 yards of total offense, 114 of which came in the second half. Glastonbury did have some momentum on the ground, but needed 31 attempts to get 105 yards rushing. Tenney had 49 yards and the score, while quarterback Drew Daniels had 39 yards rushing and 50 yards passing. Plantamuro stepped up in a big way for Southington on the defensive side. He was involved in seemingly every play and solidified himself as a leader of the defensive unit. One aspect Southington will have to clean up is committing penalties. The Blue Knights had eight penalties for 67 yards in the game, and two of those games came on the last drive of the first half and cost the team two chances at scoring. Up next, Southington hits the road for a matchup at Simsbury next week. The Blue Knights know they have things to work on before the game, but are feeling confident after the performance against Glastonbury. Passing - Southington: 16-24-356-5TD. Glastonbury: Drew Daniels 8-16-50. Cameron Fox 0-2. Posted in New Britain Herald, Southington on Friday, 7 September 2018 23:54. Updated: Saturday, 8 September 2018 17:20.